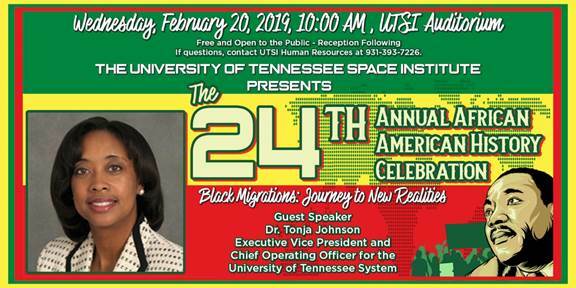 TULLAHOMA, TN – The University of Tennessee Space Institute is holding the 24th Annual African American History Celebration in the auditorium on Wednesday February, 20th at 10:00am CST. The special guest speaker this year is Tonja Johnson, PhD. Johnson is the executive vice president and chief operating officer for the University of Tennessee System in Knoxville, TN. Her primary responsibilities include overseeing and coordinating the UT System’s operating performance and achieving its strategic goals and objectives. Johnson, a native of Alabama, began her college career at the University of Alabama, (UA) in 1987 as a New York Times Scholar and earned both a BS and MS in Mass Communication from UA between 1991 and 1996, respectively. She later earned her PhD in Urban Higher Education from Jackson State University in Jackson, MS in 2006. She completed the Institute for Education Management at the Harvard Graduate School of education in 2008 and earned post-baccalaureate certification in construction management from Louisiana State University, (LSU). Johnson is a member of several boards, including The Historic Theatre Foundation Board of Directors, the West High School Foundation Board of Directors, and the University of Alabama Library Leadership Board. Please come join us at the University of Tennessee Space Institute for this special occasion; admission is free and a reception will follow in the UTSI lobby.